Sexes alike. Purplish-blue plumage; long red legs with oversized toes distinctive; thickish red beak; bald red forehead (casque); white under stumpy tail, seen when tail flicked up; bald red patch on forehead smaller in female than male. Small parties amidst reeds and other vegetation on marsh and jheels; sometimes large gatherings on vegetation-covered waterbodies; walks on floating growth, rarely swims; rather tame in some areas. vegetation and reed-covered jheels, tanks. vegetable matter, seeds, tubers; known to damage paddy crops; insects, molluscs and small frogs. mostly resident throughout the subcontinent, up to about 1,500m in Kashmir. 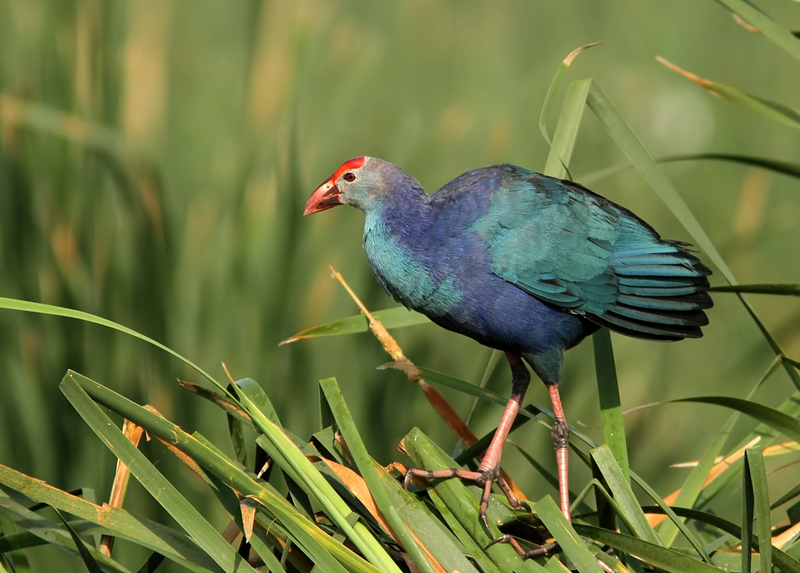 Popularly known as the Purple Moorhen or Gallinule, the Purple Swamphen is a locally common breeding resident in our area. It requires reasonably large wetlands with lots of floating vegetation and preferably some reeds in which to hide and nest. It seems to be particularly fond of eating water hyacinth, often grasping the stem, parakeet-like, with one foot. Where there are large mats of water hyacinth it can form large scattered flocks of up to 400 birds. Purple Swamphens are large birds and look like great blue chickens stalking out in the swamp. They breed during the monsoon when they can be heard making their varied grunts, hoots and explosive rattles. The black downy young (which soon become as big as Common Moorhens) follow the parents around, begging for food as soon as they are hatched. noisy when breeding, a mix of cackling and hooting notes.